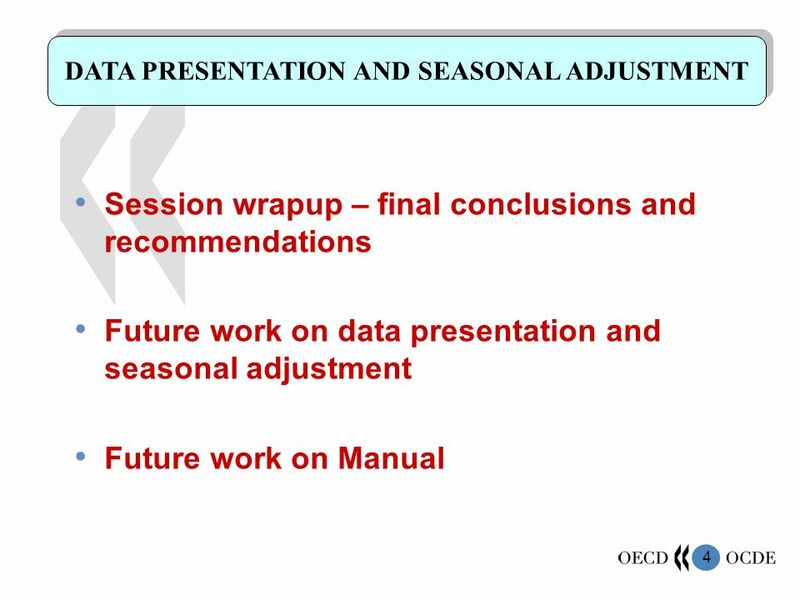 1 DATA PRESENTATION AND SEASONAL ADJUSTMENT - Background to work - DATA PRESENTATION AND SEASONAL ADJUSTMENT - Background to work - SHORT-TERM ECONOMIC. 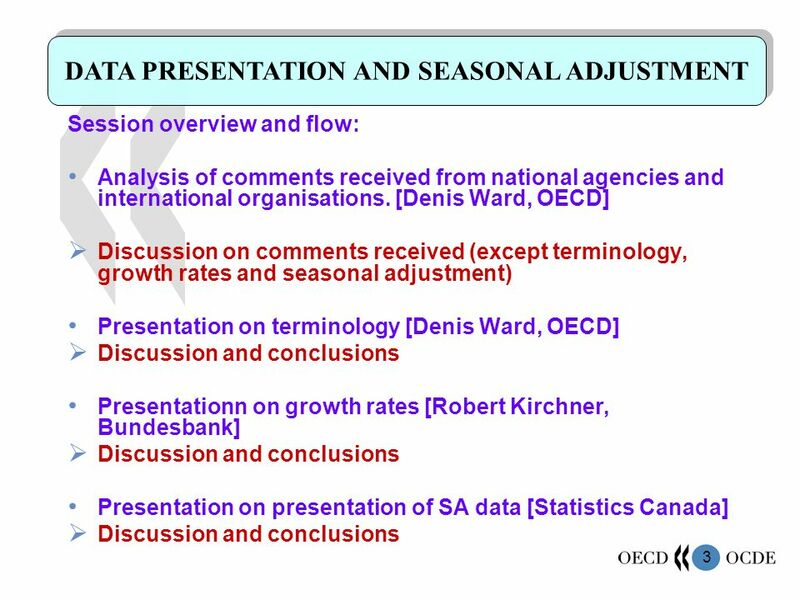 Download ppt "1 DATA PRESENTATION AND SEASONAL ADJUSTMENT - Background to work - DATA PRESENTATION AND SEASONAL ADJUSTMENT - Background to work - SHORT-TERM ECONOMIC." Introduction: the New Price Index Manuals Presentation Points IMF Statistics Department. 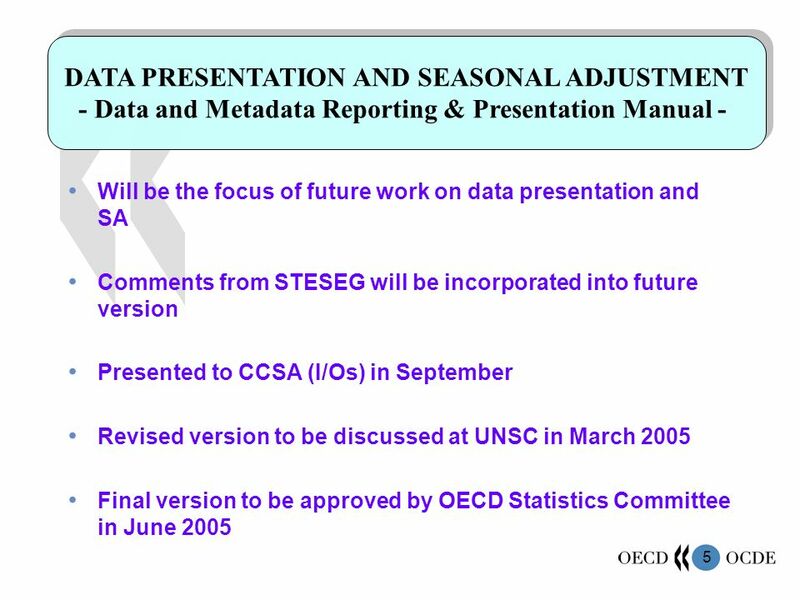 VALUATION Working Party on Financial Statistics 2– 4 November 2009 – Item 3.a. by Michèle Chavoix-Mannato (STD) OF QUOTED SHARES. 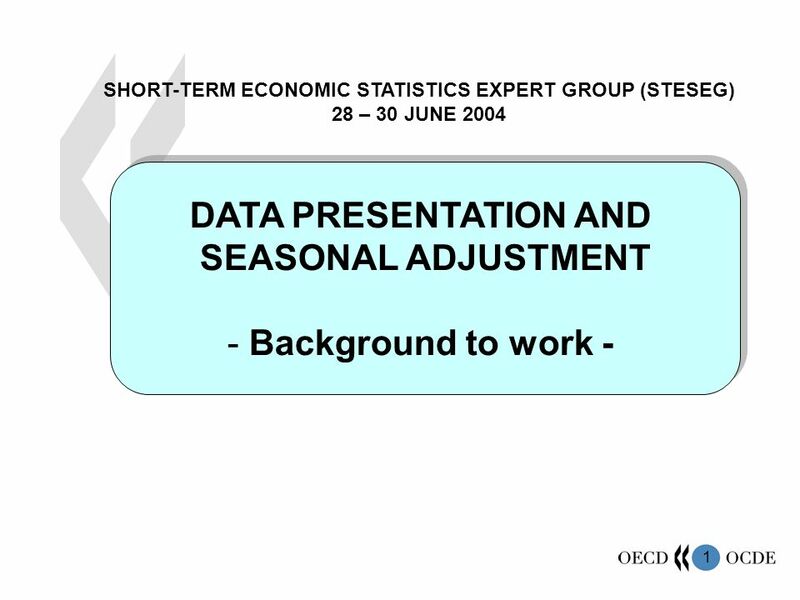 1 Meeting of the OECD Short-term Economic Statistics Expert Group June 2002 FUTURE OF SHORT-TERM ECONOMIC STATISTICS DISSEMINATED BY THE OECD. Welcome to the Strategic Planning Module of the ASTM 2002 Officers Conference Facilitators: Kathie Morgan and Dan Smith. SEEA 2003: chapter 5 Accounting for economic activities and products related to the environment and chapter 6 Accounting for other environmentally related. STD/PASS/TAGS – Trade and Globalisation Statistics STD/SES/TAGS – Trade and Globalisation Statistics OECD collection of Trade in services data Trade and. RPEWG REPORT June 2002 PCC Meeting James Leigh-Kendall. WECC TEPPC – March 14, 2008 PCC – TEPPC Coordination Roles & Responsibilities – RE Kondziolka 1 PCC – TEPPC Coordinating Roles and Responsibilities WECC. Western Electricity Coordinating Council Market Issues Subcommittee Report to the Market Interface Committee Philip Tice October 30-31, 2008. APEC Telecommunications & Information Working Group Best Practices for Implementing the WTO Telecommunications Reference Paper Bill Scott Director, Trade. 1 Improving School Leadership: Were to go from here Beatriz Pont Education and Training Policy Division Brussels, VLOR 2 nd Workshop of Participating Countries.